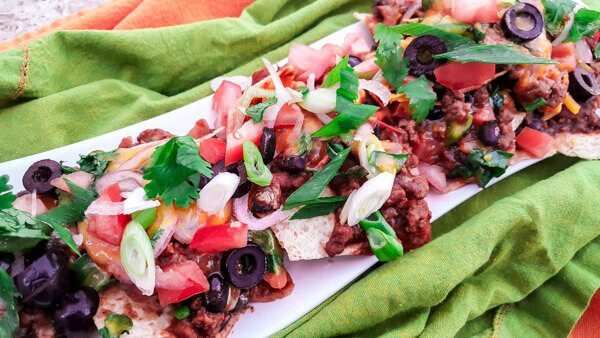 Nachos Supreme | Mexican Appetizers and More! Who doesn’t love Nachos Supreme? Perfect snack, appetizer or even as a meal. 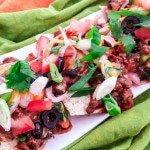 Made with ground turkey, black beans, refried beans, red onions, black olives, tomatoes, scallions, jalapeños, cilantro, smoky spices, cheddar cheese, homemade salsa verde and tortilla chips. A perfect Friday night treat! Who doesn’t love nachos especially Nachos Supreme?! Topped with all the goodies. The refried beans, onions, tomatoes, scallions, black olives, serrano peppers, jalapeños, cilantro, salsa, sour cream and of course whatever meat you like…..and whatever else your little heart desires! This is always a quick appetizer I can make for my family and sometimes we even have it as a meal because sometimes you just want a little bit more! And you know me and my Mexican appetizers, they always have to have a little kick to them. So for my Nachos Supreme, I also added some salsa verde! Because in my opinion anything tastes better with a little kick to it. I like to make my Nachos Supreme with homemade baked tortilla chips but I was running a little late doing some Christmas decorating and wrapping, so I decided to use the store-bought kind. And of course it was as delicious! Did you know nachos were invented in 1943 in Coahuila, Mexico by a gentleman named Ignacio “Nacho” Anaya. As the story goes, these woman were on a shopping trip shopping and ran into a restaurant that had already closed and Mr. Anaya, concocted a dish together with what he had left in the kitchen. He quickly cut corn tortillas into triangles, fried them and topped them with melted cheese and sliced pickled jalapeños. When the women asked him what was the name of the dish, he called them Nacho’s Especiales or Special Nachos! Anaya went on to open a restaurant called Nacho’s Restaurant. Soon the word spread and the rest is history! October 21 was declared, the International Day of the Nacho after Ayana’s death in 1975. Now on October 13th and 15th in Piedras Negras, Coahuila, Mexico, the International Nacho Festival is held and features the biggest Nacho of the world! Which is later on registered in the Guinness World Records. So let’s get to it my friends! These are soooo good! Who doesn't love Nachos Supreme? Perfect snack, appetizer or even as a meal. Made with ground turkey, black beans, refried beans, red onions, black olives, tomatoes, scallions, jalapeños, cilantro, smoky spices, cheddar cheese, homemade salsa verde and tortilla chips. A perfect Friday night treat! Add 1 tablespoon of oil to a skillet over medium heat. Add ground turkey and cook for about 5 minutes. Add white onions and cook for another 5 minutes. Drain black beans and add to meat. Add refried beans with half a cup of water. Add chili powder and cumin. Mix well together and cook for another 5-10 minutes. Preheat oven to 400 degrees. Layer some chips on a baking dish and add some of the meat mixture. Layer more chips and add the rest of the meat mixture. Top with red onions, jalapeños, cheddar cheese, olives and half the tomatoes. Top with the rest of the tomatoes, scallions and cilantro. Serve immediately. Enjoy!